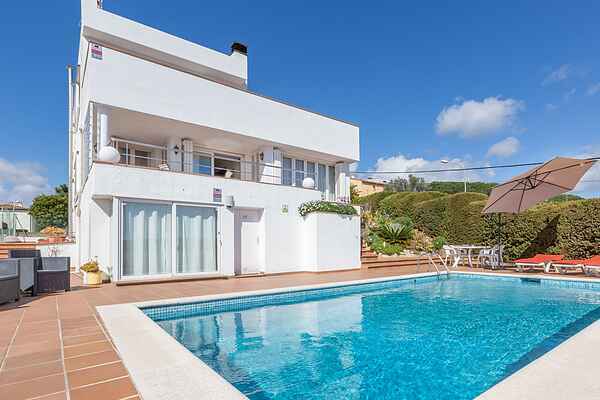 Attractively situated in the charming Residencial Blanes neighbourhood, this villa is tastefully decorated and has a private swimming pool and sun terrace with a panoramic view of part of the Costa Brava hinterland. In the distance, but luckily not too far (2.5 km), you can already perceive the azure waters of the Mediterranean. A view that you won't forget in a hurry! Another wonderful bonus is the spacious and comfortable roof terrace. Once you arrive, you will see the beautifully landscaped, multi-levelled garden with stairs that catch the first rays of the sun. The fenced in garden, extremely safe for children, is beautifully designed. Various palm trees, an apple tree, plenty of native shrubs, flowers and lawns - let there be no misunderstanding: you will definitely find yourself in a magical and wonderful holiday area. The supermarket is just 1.5 km away. Within a radius of 2.5 km you will find everything that you are looking for. For example, the beautiful sandy beach of Blanes with its formidable promenade and numerous shops, cafes and restaurants, or the beach of Cala Sant Francesc. A little further away is the fantastic Girona ( 38km) with its historic cathedral and the special Moorish baths, or Vic ( 66km ), with its stunning medieval style houses.